Increase in construction activities for residential & non-residential projects, rise in demand for eco-friendly and energy-efficient doors, and increase in remodeling and home improvement expenditures drive the growth in the global interior doors market. 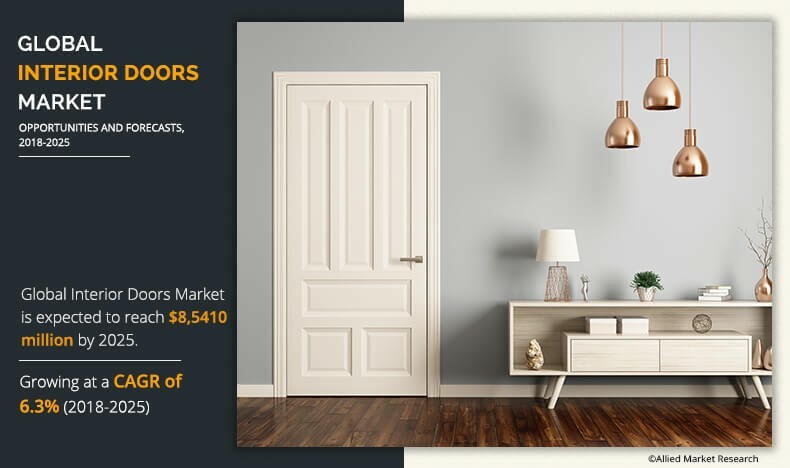 According to the report published by Allied Market Research, the global interior doors market garnered $52.61 billion in 2017 and is estimated to generate $85.41 billion by 2025, growing at a CAGR of 6.3% from 2018 to 2025. The research offers a detailed analysis of the current market trends and growth opportunities along with drivers, restraints, opportunities, and key segments of the market. The research also outlines strategies to be adopted by market players to gain international presence. Increase in construction activities for residential & non-residential projects, rise in demand for eco-friendly and energy-efficient doors, and increase in remodeling and home improvement expenditures drive the growth in the market. In addition, surge in demand for raw materials and supportive government policies to adopt polyvinyl chloride (uPVC) for its enhanced energy efficiency supplements the growth. However, expensive cost of packages of eco-friendly products restrain the market growth. On the other hand, rapid industrialization & urbanization and surge in disposable income in emerging countries would provide new opportunities for the market players. Among the door types, the panel doors segment contributed the highest market share of nearly two-thirds in 2017, and is expected hold the dominant position in terms of revenue by 2025. This is due to the huge demand for panel doors from builders and home owners for its weatherproofing properties and lesser maintenance as compared to other door types. However, the bypass doors segment is expected to witness the fastest growth rate with a CAGR of 7.3% during the forecast period. The report also analyzes pocket doors, bifold doors, and others. Among the product types, the wood segment contributed more than half of the total share in 2017 and will maintain its leadership position in terms of revenue dominant throughout the forecast period. This is due to its advantages such as biodegradability, renewability, and the lowest carbon footprint. It is the preferred material of choice owing to its thermal insulation properties, high strength, workability, and strong aesthetics. However, the fiberboard segment would register the fastest growth rate with a CAGR of 7.9% during the forecast period. The report provides insights on the types such as metal, fiberglass, glass, vinyl, and others. Asia-Pacific garnered more than half of the total share in 2017 and is estimated to maintain its dominant position during the forecast period. This segment would also grow the highest growth rate with a CAGR of 6.9% from 2018 to 2025. This is due to surge in demand for interior doors in various regions including China, India, and other countries. The key players discussed in the research include Artisan Hardware, Chaparral Doors, Bayer Built WoodWorks Inc., Concept SGA., Colonial Elegance Inc., Jeld-Wen Holding Inc., Contractors Wadrobe, Rustica Hardware, Masonite International Corporation, and Simpson Door Company.